Description: This extreme close-up of the SR-71B operated by NASA’s Dryden Flight Research Center, Edwards, California, gives an unusual view of the twin cockpit of Dryden's SR-71B, NASA 831, and its helmeted crew members. 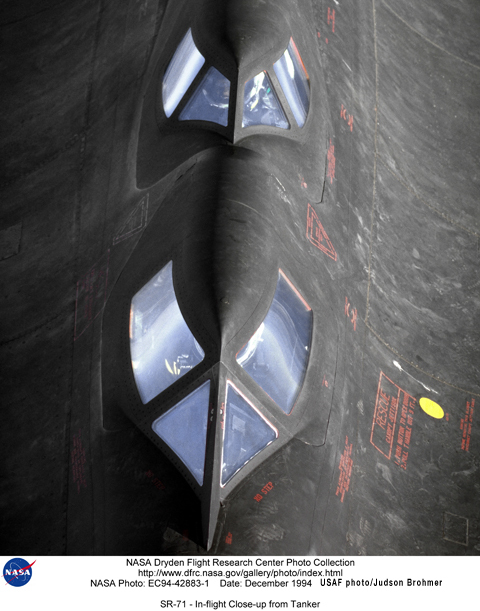 The photo was taken from an Air Force tanker refueling the Blackbird during a 1994 flight. The Mach 3 Blackbird aircraft were loaned to NASA by the U.S. Air Force for high-speed, high-altitude aeronautical research. Capable of flying more than 2200 mph and at altitudes of over 85,000 feet, they are excellent platforms for research and experiments in aerodynamics, propulsion, structures, thermal protection materials, atmospheric studies, and sonic boom characterization.